You'll discover how to plan and plant an impressive cactus dish garden here. Whether you want a small grouping of cacti or a large bowl spilling over with a huge array of succulents, you'll get ideas plus all the steps to make your own dynamic display. Different types of succulents and cacti look great when put together, adding a wide range of shapes, textures and colors to your miniature desert landscape. The creative possibilities for your own imaginative cactus dish garden scheme are endless. Your only restriction is to choose plants that require the same growing conditions if you want to grow them together. 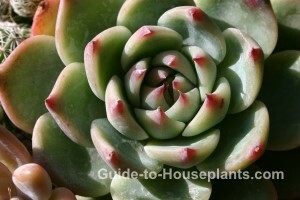 Echeveria elegans (pictured at right) is an easy-to-grow plant for succulent gardens. 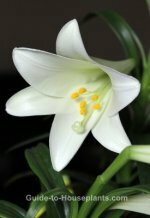 It has a beautiful rosette form with tall spikes of bell-shaped blooms appearing in summer. Echeveria fimbriata (shown at left) has an upright, rosette form with leaves that often turn purplish-green. You can expect it to bloom in late summer with red and orange flowers. Choose plants that like each other. If they share the same demands for light, temperature and water, you can be sure that they're compatible. 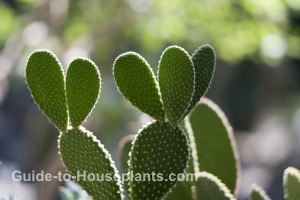 Prickly pear cactus (pictured at right) has flat, fleshy pads that grow on top of each other, resembling bunny ears. It is part of the largest cactus genus, Opuntia. Handle with caution -- its barbed spines are sharp! Want More Ideas? Check out the succulent and cacti indoor rock garden for more tips and resources. A fast-draining, sandy mix, such as cactus potting mix works best for all types of succulents. Choose a shallow planter . Cacti and other succulents have shallow roots, so the dish only needs to be 3 in (8 cm) deep. A 9 in (23 cm) terra cotta bowl works fine. It doesn't need to have drainage holes because the sandy potting mix is fast-draining. Just be careful not to overwater. You'll need a small trowel to fill the cactus dish garden with potting mix. A small, clean paintbrush comes in handy to clean off plants after they are planted. Small pebbles or rocks for the surface of the cactus dish garden. Before planting, set your plants in the dish to see how they'll look together. Don't overcrowd. You'll want to show off the contrasting forms and textures of the plants. Giving your plants some space will also allow for growth and good air circulation. Fill the dish half-full with potting mix. Remove each plant from its pot and place in the new dish. Use your fingers to spread the roots over the mix, if necessary. Once all plants are in place, add more mix to fill the container. Make sure the plants are sitting at the same depth as they were in their original pots. Lightly pat the potting mix around the plants, leaving about 1/2 in (1 cm) space below the rim of the container to allow for watering. 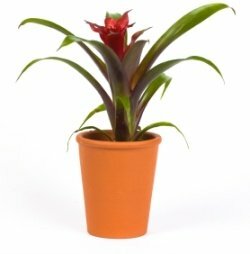 Use a small, soft paintbrush to gently remove any potting mix on plant leaves or between cacti spines. Spread small stones or pebbles on the top of the soil after planting. A dressing of small stones will give your arrangement a finished look. Add decorative rocks to fill in gaps, if you want. Watering Tips: After your dish garden is planted, water succulents right away with room-temperature water. Wait a few days to water cactus plants, watering lightly for the first couple times. Choose a beautiful garden already planted with thriving cacti and/or other succulents, or make your own. 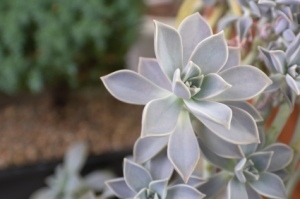 Care is easy -- these plants are low-maintenance and drought-resistant. 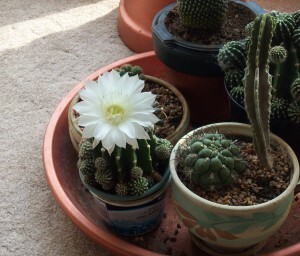 Best of all, you'll enjoy your cactus dish garden for a long time.